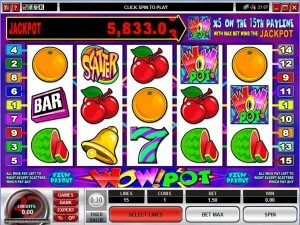 The modern version of Wow Pot (there is also a slot with 3 reels), offers the same progressive jackpot as its classic relative, with symbols being the same ones, but having some extra features as well to offer. The design remains just as classic inspired and it feels like an older title thanks to it, but that doesn’t take away from the fact that it has that progressive prize to attract players. The same developer created it, Microgaming. Despite the classic inspired symbols, it’s a 5 reel game and it has up to 15 active lines each round. The game’s simple features include a scatter and a wild, with multipliers used by the latter. Its biggest prize is a progressive jackpot. 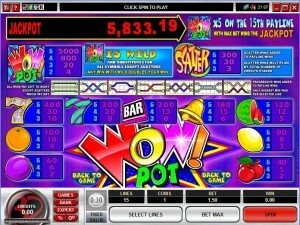 Only two feature symbols are present in Wow Pot 5-Reel, a wild symbol which doubles prizes and a scatter which will offer cash. The same symbol which was a wild in the classic slot is also used for the 5 reel version. I’m talking about the Wow Pot Logo symbol. The prizes it awards here will go up to 5,000x when it forms its own combo of up to five symbols. If the wilds form the combo of five on the 15th line and with the maximum wager used that round, you get the progressive jackpot instead. While used as a regular wild, it contributes by taking the role of other symbols, but only if this action results in a newly formed combo or an improvement for an existing one. A 2x multiplier is applied whenever the wild contributes to a new combo. The other symbol uses a simple Scatter Logo, and it’s a scatter obviously. It can show up on any reel, offering prizes based on the total number of symbols of this type present during the same spin. Between 3 and 5 symbols with Scatter Logos will trigger payouts of 3x to 300x the total wager. The game might not have a huge progressive jackpot, but it’s not very expensive to play either. A single $0.10 coin is used for each line, so you can spend up to $1.50 each round. The progressive jackpot is won if you get the combo of five wilds on the slot’s 15th payline. History tells us that it is won at an average amount of $15,000, but it has gone as high as $51,000 in the past. If you get the combo on any of the other 14 lines, you win 5,000 coins, up to $500. The design is very simple and very classic inspired, with the symbols showing off things like fruits, 7s and Bar icons. The only two that aren’t classics come with Logos on them, and they act as the feature symbols. It’s hardly a design to be impressed with, but since it can offer a progressive jackpot I’m sure there will be players that will not have a problem with it. 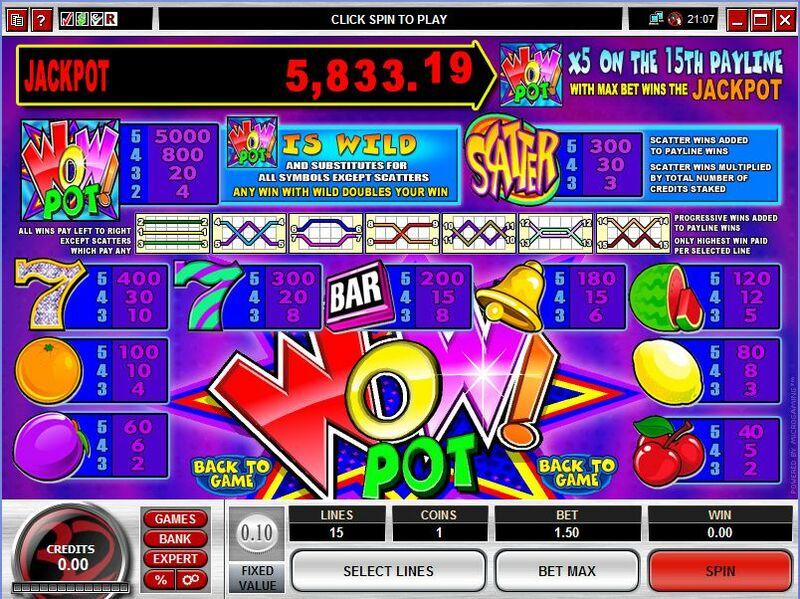 Symbols: Wow Pot Logo (5,000x/progressive jackpot, wild), Scatter Logo (scatter, 300x the bet), Diamond 7 (400x), Green and purple 7 (300x), Bar (200x), Golden Bell (180x), Watermelon (120x), Orange (100x), Lemon (80x), Plum (60x) and Cherry (40x). If you’re looking for a good design, Wow Pot doesn’t provide one, but you get a progressive jackpot which might be enough of an incentive. 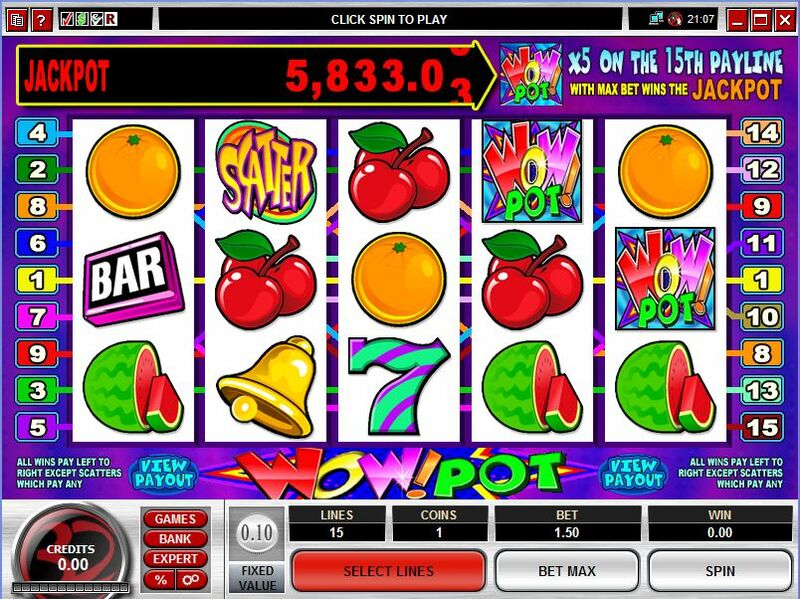 The Wow Pot 5-Reel slot machine is offered through the Microgaming platform, so if you want to play it for real or just to practice, look out for casinos that use it.